Charles Warren Eaton was born in Albany, New York in 1857 and worked in a dry goods store until his early twenties. He moved to New York City in 1879 and attended classes at the National Academy and the Art Students League. In New York City he became friends with another Albany painter, Leonard Ochtman, and with Ben Foster. Possibly through their agency, he adopted the Tonalist style which was fast replacing the Hudson River style as the dominant American aesthetic. His tendencies in this direction were undoubtedly augmented when, in 1882, he met George Inness, who singled out Eaton’s work during a lecture he was giving. 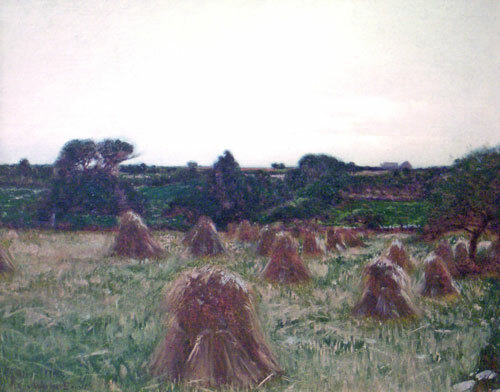 In 1886, Eaton took a New York studio adjacent to that of Inness. Inness purchased one of Eaton’s paintings, and the two became friends, Eaton sharing, for a time, Inness’s studio in Montclair, New Jersey. Upon the death of Inness in 1894, Eaton continued his friendship with the artist’s son, George Inness Jr.